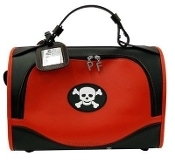 Pirate skull carrier. This is an airline approved carrier designed for easy stowaway. Comes with a removable, washable pet mat.